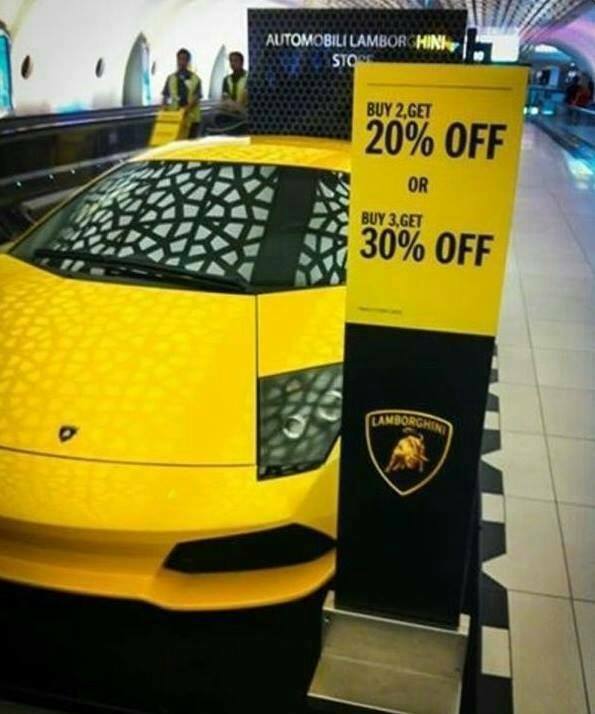 Congratz if you can afford this offer. Buy 2, 20% discount. Buy 3, 30% discount. Never mind, with the traffic jam I'd be lucky to get pass 60mph with it. I'll stick to used cars, thank you. Oh sure - what a deal! I guess you could drive even faster to the 'poorhouse' with the cost of gas. I will take blue for Sunday, silver for Monday, black for Tuesday, red for Wednesday.... (and so on). So...if I buy 10, they should be free. I'm astonished if they can afford to sell three at 30% off ... I would have thought their profit-margins were well under 30% (they certainly were when the company last changed hands - and it's been in bankruptcy at least once?!). Don't worry, it must be a volume game, with the hope 1 million sold in a week. That's what I was going to post (10). Me too. You should both be worried about that. I was going to post 10 also. But Frank "Quick on the draw" Donovan had to beat us all to it. Besides, I know nobody is going to Thank my post anyway. You bunch of Silly Nannies. So now you want thanks for something you claim you were going to do? Forget it. Some of us have exacting standards. "I have money, but no taste"